The range of challenges leaders are facing is increasing as is the complexity they manage. Staying current on key issues is become increasingly challenging. Where do you go for information based on latest research and implemented by leading executives? Welcome to transforming organizations thought leadership, designed to share interviews and blogs from successful executives and consultants discussing facets of organizational transformation. We believe one key to successful transformation projects is to listen to people who have successfully done the work. Our Voice America series, Innovative Leaders Driving Thriving Organizations is designed to present genuine conversations with successful leaders and consultants across a broad spectrum of fields talking about transformation insights. This resource is intended to offer unique, high value conversations and research. These conversations are often accompanied by Organization Transformation blog posts for those interviewed. 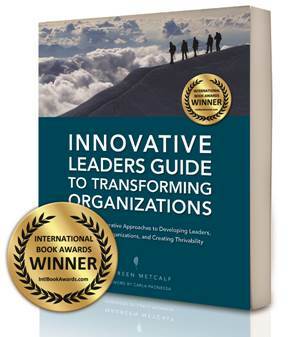 We just launched an online organization transformation leadership program that combines the award winning organization transformation fieldbook with the latest Voice America leading transformation interviews. Contact us to learn more about this and other online programs that can be offered as stand alone training or augmented with coaching and in person or Zoom based remote training. 2013 International Award winner. Leading change starts with leadership and yet in many organizations the process of leading change often omits the idea that transforming leaders is part of the overall transformation process. Section I of this Guide focuses on individual leadership to help you build an understanding of what innovative leadership is and how you can apply it to transform your organization. We explore each of the five elements in detail and give examples of how you, as an innovative leader, can use these elements in your transformation effort. Section II of this Guide focuses on the process of leading transformative change to address highly complex organizational challenges. This section puts innovative leadership to work by building on what we learned in Section I. It provides a change model and gives an example of how an innovative leader implements transformative change. It provides a change model and practical tools and steps that you can use to lead change. John Heiser MBA, JD, PhD discusses business as a social institution. Can we maximize value for the firm and at the same time create value for society? How is shareholder value maximization aligned with or in conflict with social good. Mike gives examples of how he drives both profit and social impact. This includes: 1. Appreciative inquiry summit 2. Partnering with Autistic organization to hire adults with autism to fill routine jobs 3. Hiring interns to fill roles and providing education How have you created buy-in for novel processes? 1. Use tools like appreciative inquiry to create alignment, involvement, and commitment across the entire organization 2. 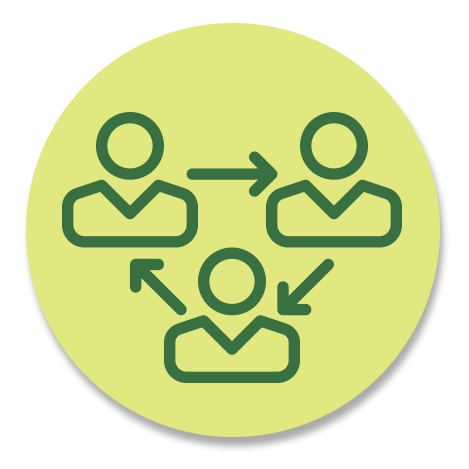 Establish processes for inclusion of staff and clients and at the same time ensure leaders retain positive control and accountability for results. How do we create organizations that promote mindfulness and joy during work. Subanhu Saxena from the Gates Foundation talks about how to build mindfulness in organizations. Great leaders uniting people around a making positive impact on society – a deeper purpose. Great leadership starts with knowing yourself and is built through the power of introspection. This allows you to be more humble, authentic and vulnerable. Mindfulness practices allow you as a leader to be fully present and aware of the moment. Michelle Harrison talks about how she demonstrates authenticity as a leader, a CEO, and a mother. She gives a very honest account of changing business plans because of her personal commitment to her family. In an era where we talk about authenticity and balance, we often see organizations expect their leaders to continually prioritize work over family. There are certainly many times that work will need to be a priority and yet, Michelle talks about her personal decision to balance and what that looks like in her life. Mike Sayre and Dr. Dale Meyerrose talk about their transformation success – it sounds as if they created a plan, executed on the plan and declared victory. In working with large complex change, this is rarely true. Things happen that derail the project such as acquisitions, divestitures, and market changes. The test of a successful leader is how he or she responds to the changes that happen and pivots to revise the strategy for success and implements these changes. Interview with Terri O’Fallon and Geoff Fitch. This is a two part interview series exploring the idea of Level 5/Teal organizations. During this discussion, we delve into how we can foster the development of these leading edge capacities. Further exploring organizational shadow and integrative thinking, we will look at case studies, practical examples and interventions that support level 5 leadership and organizational development. ● Why are trust and safety important quality in teal organizational culture? ● Are level 5/ teal capacities skills that we can learn or do we just have to “be” a level 5 / teal leader? ● Exactly how can organization and leaders become more adaptive? ● What is organizational shadow? Why is it important? How can we identify it and work with it? ● What are organizational polarities and how to teal leaders and organization deal with them that goes beyond decision making or multiple bottom line? This exploration is important for leaders aspiring to reshape their organizations. This interview is recorded live at the CIO Tomorrow Conference on April 14, 2016. It includes conversations with two keynote speakers – Thai Lee and Dr. Dale Meyerrosetalking about disruptions in the technology industry and their views on how to run organizations that will thrive in and era of rapid disruptive changes. In early 2015, Fortune magazine sent a survey to each of the Fortune 500 CEO’s, asking in part what their companies saw as their greatest challenge. Not surprisingly, the largest response was the rapid and disruptive pace of technological change. Those CEOs knew that disruption creates pivotal points at which normal patterns can no longer reasonably be maintained. Their concerns about how these new advancements will impact the future expectations of their companies, both from a capabilities and a consumer point of view, are important perspectives worthy of serious consideration. Change is a choice, not a mandate. Organizational health is driven by this choice. Carla Morelli and Laura Hult talk about mergers and acquisitions focusing on key factors that drive success and failure. They are seasoned M&A veterans, participating in many transactions and both have seen similar themes. This interview provides insights and recommendations to improve the probability of success for your next transaction – whether you are acquiring, selling or involved in the integrations. 50% – 80% of acquisitions fail to deliver intended results. We will explore key success factors: 1. Understanding the deal goals – the why of the transaction for both sides; 2. Working with the human factors that have the greatest impact (and M&A transactions fail without considering humans and dealing with their needs); 3. Navigating the organizational factors. The participants share their stories of success and their unique perspectives. As a CIO with Nationwide, Guru Vasudeva shares his extensive experience with implementing lean and agile practices across a large IT organization. He shares his challenges, recommendations and financial and quality results. He answers the following questions: 1. Does lean only apply to operations? 2. What results has Nationwide been able to achieve through Lean IT? 3. As a CIO – how have you changed your leadership style to run an organization that is using lean and agile? 4. How does lean relate to innovation? 5. What advice you have for CIOs who are embarking on a Lean transformation? Leaders will better understand the nature of the threats we currently face and how to take proactive steps to optimize organizational success by taking advantage of the cloud and at the same time protect organization’s critical to position to run efficient and effective organizations. During this show, Maureen Metcalf and Dr. Dale Meyerrose discuss several questions raised by an executive forum to provide a perspective from senior leaders: 1. Overview of the cyber security landscape – what is real and what is hype? 2. Address specific questions from the executive forum members about cyber security. 3. What should leaders and boards be thinking with regard to cyber security? This session provides listeners with a strong foundation to understand and plan their next steps required to keep their organizations operations and data safe. A key element of successful leadership in this dynamic time is successfully implementing large scale change. Kathy Starkoff has extensive experience successfully transforming large IT organizations as well as advising others on their implementations. She is an expert in all facets of IT including cyber security and risk management. This show will give you a better understanding of how leaders and their organizations successfully implement large scale change. This interview will include the following questions: • How does an organization achieve sustainable large scale change? • What are the critical components of large scale change? • Why does it always take so long? • How do you recognize issues along the way? • How do you address issues along the way? • What is the probability of a typical project’s “success”? • What are the most common mistakes made? Christoph Hinske gave a keynote speech to the World Green Building Council in Venice focused on retrofitting all buildings in Europe. The gathering was part of the EU funded BUILD UPON project, the world’s largest collaborative effort on building renovation – bringing together over 1,000 organizations, across 13 countries, at over 80 events in 2016-17. As leaders focusing on implementing multiple concurrent changes – it is imperative that we understand what drives change and what inhibits it or just drains our energy. He discusses the following: 1. Tell us more about the World GBC project. 2. How does your work with agreements increase the probability of successful transformation? 3. What is an agreements map and the cost of scarcity calculation? 4. How does mapping and calculating the cost of agreements drive change? 5. What concrete steps can I take to evaluate my agreements? Business Analytics is a hot topic for many organizations. Analytics programs can be a significant differentiator for organizational success when implemented successfully When done poorly they waste money, time and good will. James Brenza talks about: 1. Which is more important – technology or leadership? 2. How much does leadership capability impact outcomes? 3. What are “leadership maturity levels” and how do they impact implementation success? 4. How do you use your understanding of leadership maturity to increase your program success and ROI? 5. What are the most important leadership traits to successfully implement analytics programs and why? 6. What are some warning signs you look for when leading an implementation? 7. What resources do you recommend to support implementation success? A senior Consultant’s View: What Drives Successful Transformations? Many organizations are facing complex large scale change initiatives. We have talked about innovation, agile organizations, the future of the organization and future trends. Kathleen Bergen shares her experience leading large projects and give practical insight. She will answer the question – what do I need to know before I start a project that will increase my likelihood of success during the project and sustaining the progress we made after implementation. Here are the main conversation topics: 1) What are the top 5 drivers of successful implantation 2) What causes failure – explain the top 5 barriers to success 3) What do you wish clients knew and understood at the outset? 4) If you could hand out a magic pill that made sure they understood two key points – what would those be? 5) What needs to happen to support value realization after project completion? 6) If you were to share 1 success and 1 failure – what would you want others to learn from your successes and struggles? How Do Transformation and Leadership Connect? James Brenza interviews Maureen Metcalfand Dan Mushalko about the interplay between leadership and transformation. Dan will share his experience in leading the transformation of a public radio station. They will talk about: 1. How do you connect transformation and leadership to create successful results? 2. Qualities required to successfully implement transformation 3. How does leadership drive transformation success? 4. How do you develop leaders to meet transformation objectives? Maureen shares the concepts and Dan illustrates them with his experience. As effective leaders, it is critical to recognize and anticipate market shifts and proactively position companies to be nimble, but stable, during these times. Joe Gallo is known for his ability to shape companies to thrive in the face of industry transition. He is also community focused – building community partnerships. During the interview we explore Joe’s experience with large scale industry change and how community involvement has contributed to the success of the Dispatch Printing Company. We discuss: 1. The bulk of you career has been spent in companies and industries that were either emerging like the internet or changing like media. What qualities do you think are most important to drive change in this environment? 2. Your work at the Dispatch Printing companies leverages the community as a whole – building on public and private partnerships – can you share some of that work and why you think it contributes to a healthy ecosystem and translates to business success? Paul Gibbons talks about his new book (continuation of an earlier interview) focused on large scale change and the concepts of agility and anti-fragile. These are foundational concepts for leaders looking to build organizations that are able to respond quickly to predicted and unpredicted change. Being agile and ‘anti-fragile’ positions organizations to be resilient to the shocks they will face and enable them to be proactive – leveraging the shocks that adversely impact other organizations. Paul and Maureen will discuss: 1) What is anti-fragility? 2) What are some real-world examples of anti-fragility? 3) Why should this be of interest to business leaders? 4) Do we know of business organizations that are anti-fragile? 5) How might a leader use these principles? 6) How can a leader use these principles to position the organization to proactively respond to threats? Maureen Metcalf & Carla Morelli. Integral Leadership Review, October 2015. To learn more about the process of building and maintain thriving organizations, explore our offerings. Contact us to schedule an exploratory conversation.